For years professionals have recommended lid hygiene and massage to their patients for healthy eyelids, and then watched as they struggled with homemade mixtures and dilutions, fumbled with cotton tips and pads, and put up with stinging and burning. Many patients would even develop drying of the delicate eyelid skin. 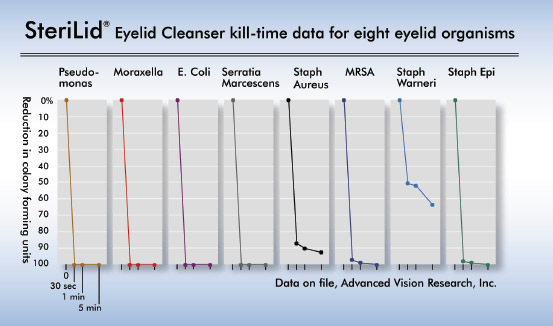 Now SteriLid Eyelid Cleanser puts all that science has to offer into a “gentle-on-the-eye-tough-on-bugs” formula designed for lid hygiene, delivered in convenient ready to use foam. Daily lid hygiene is important for those with blepharitis and dry eye, as well as those preparing for eye surgery. Lid Hygiene to maintain eyelid health has never been easier. SteriLid not only cleanses the eyelids and eyelashes, but also conditions the delicate skin around your eyes with its hypoallergenic, pH matched to skin formula. While daily lid hygiene is important for everyone, and especially important for patients with these conditions, patients have had to make do with diluted mixtures of baby shampoo or soap-pads designed to remove eye makeup. Linalool, a key ingredient in SteriLid, is a naturally-occurring liquid distilled from plant oils with wide use in personal care products based on its pleasant floral scent. It is found in many flowers and spice plants, as well as in tea tree oil. Linalool has been formulated into SteriLid to create a “gentle-on-the-eye” eyelid cleanser that cleanses yet, with its pH-matched-to-skin formula, helps maintain the skin oils that have antibacterial properties, and provide the skin with a natural defense. Pumped onto and then applied directly with clean fingertips, SteriLid conditions the delicate eyelid skin while providing effective lid hygiene with comfort and convenience.